Posted April 19, 2017 by The Rapid & filed under News. On April 17, we sat down with Shelley Irwin on the WGVU Morning Show to talk transit and about our proposed fare structure changes and our upcoming transition to our new e-fare system. Our e-fare system will consist of smart cards and mobile ticketing. You’ll be able to purchase fares or add funds to your e-fare account (linked to your smart card or mobile ticketing smartphone app) by visiting the e-fare website online via your smartphone or desktop, at ticket vending machines, or at the Information Center at Rapid Central Station. There will also be a retail network where smart cards will be sold at a variety of locations throughout our service area including supermarkets, convenience stores and pharmacies. You even had the option to set up auto-load to have your account add funds from a linked debit or credit card when funds are low! Using e-fare will make riding The Rapid faster, easier and more convenient. 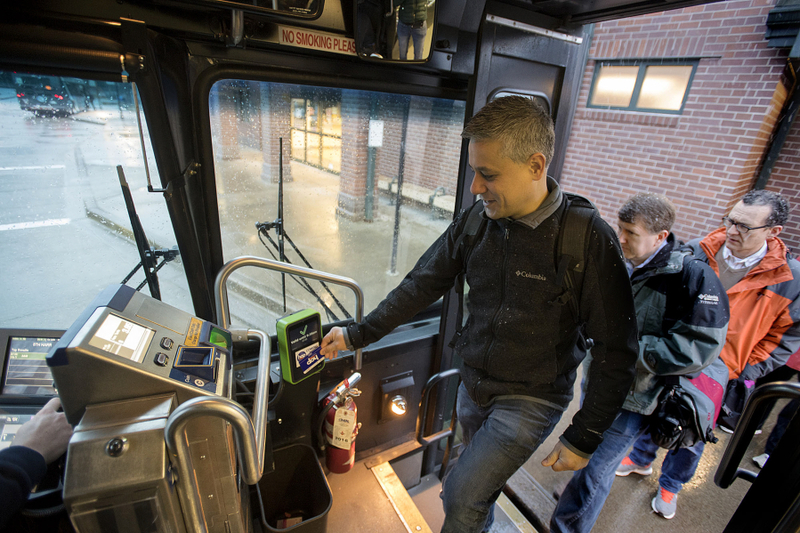 Just tap your smart card or scan your mobile ticketing smartphone app as you board the bus to pay your fare. There will be a validator located near the farebox to do this. However, to successfully transition to e-fare, we’re proposing a few changes to our current fare structure to fully utilize the new technology, expedite the boarding process and better accommodate passengers. We’re holding public meetings to in various locations through April 27 to gather feedback. Learn more about e-fare by listening to our chat with Shelley here. If you have questions about e-fare, join us at one of our public meetings.